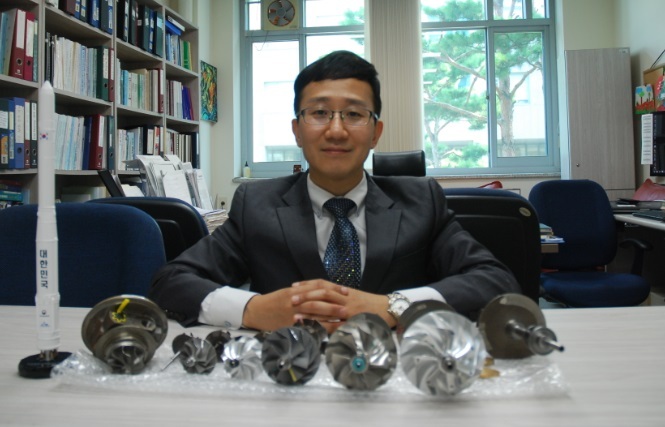 Dr. Ryu Keun, a Professor in the Department of Mechanical Engineering at Hanyang University, will be sponsored by the Korean Government with a total of 300 million won for the development of electric pumps for liquid rocket engines until 2021. Q. Please introduce your research briefly. A. My research is about the implementation of existing liquid-fuel rocket engines with turbo pumps for high-pressure fuel and liquid oxygen supply. In the gasgenerator cycle, the fuel is burned in a gas generator and the resulting hot gas is used to rotate the shaft of the engine’s pumps. Then, the gas is exhausted. Also, the electric-pump-fed-engines in the current research project use electric motor-driven pumps to pressurize the fuels, thereby burning the input fuel directly in the main combustion chamber of the rocket engines. The lower temperature gradient in the pumps and the simpler mechanical configuration allows lower development and manufacturing cost, and easier controllability of the engine system. Q. Why is the electric-pump method and the liquid-fuel rocket engine essential for later space development? A. It is because of its distinctive advantages over the existing turbo pump system. For reliable advancement of the electric-pump rocket engines, as well as for our country’s future independent space development, I would like to emphasize the importance of design, performance evaluation, and health monitoring of the motor-rotor-bearingseal systems in electrically driven pumps. However, one person or one research project will not be able to significantly change the whole space related technology. I think this is the most important key point. Q. What is the special reason to take interest in space technicalities? Tell us about your future plans. ​A. Yes. I’ve dreamed about studying space technology since I was young. The research projects are related to the wide array of rotating machinery systems at extreme operating conditions, which are conducted by my former academic advisor at Texas A&M University. My former research experience with NASA also influenced the direction of my current work. The subsidy granted by our government to research about the space launch system development is quite limited, but I will continue to conduct the related research.